NEXUS will be performing on Saturday, November 20th at 8 p.m. in Stone Ridge, New York, about 90 minutes north of New York City. With this fantastic autumn weather we have been having, you could enjoy an afternoon hike in the nearby Catskills Park, perhaps at wonderfully-named Peekamoose or Buttermilk Falls, then spend your evening enjoying the NEXUS concert! Our own Garry Kvistad, as artist-in-residence at SUNY Ulster, was asked to host three special evening events featuring “guest artists of world renown”, and his invitation to NEXUS is the third and final event of his tenure. NEXUS will be performing John Cage’s classic Third Construction (1941) which Garry describes as “full of rhythmic energy and a wild mix of cool instruments”, as well as pieces by Steve Reich, Pauline Oliveros (of the Deep Listening Institute and last semester’s SUNY Artist-in-Residence), George Hamilton Green (Ragtime xylophone selections that Nexus has revived from the 1920s; Two generations of the Green family plan to attend the concert), and a premiere of Bill Cahn’s new work Crystal Cabinet. The concert will also feature African-influenced pieces by NEXUS. There will be a pre-concert talk is at 7:00 and the concert is 8:00, both at the Quimby Theater located in Vanderlyn Hall on Cottekill Road at SUNY Ulster in Stone Ridge, Hudson Valley, New York. 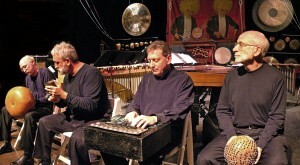 NEXUS will be joined by percussionist Chris Earley for Steve Reich’s Music for Pieces of Wood. In keeping with SUNY Ulster’s artist-in-residence policy, suggested donation is $10 at the door. For more information, call (845) 687-5262 or visit: www.sunyulster.edu.